If the PC is dead, somebody forgot to send Lenovo the memo. The Beijing-based company has been busy beavering away on a new range of all-in-one (AIO) PCs and laptops, targeting wallets of all sizes. First up is the A540 AIO, which comes with a 23.8-inch IPS display with a 1920x1080 resolution. It can pack a punch under the hood, with up to an Intel Core i7 processor and up to an Nvidia GeForce GT 840 graphics card. Prices start at US$1,280 (about AU$1,370). There are lots of new laptops on offer too, including the budget-friendly B50, which comes with a 15-inch touchscreen display packing a 1366x768 pixel-resolution. Add in up to an Intel Core i7 or AMD A8 processor, and Nvidia GeForce 820M or AMD Radeon R5 M230 graphics card, and this rig still packs some power. Prices start, and we stress start, at US$399 (about AU$425). 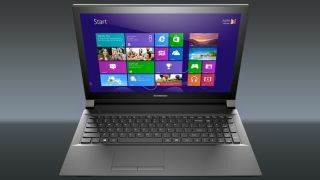 The oddest thing about this machine is that it will be powered by Windows 7, not Windows 8, suggesting that Lenovo is not entirely happy with sales of computers with the latter. Next up is the G50 laptop, featuring a 15.6-inch display with a 1366x768 pixel-resolution. It allows a similar spec as the B50, but comes with Windows 8.1 instead. Prices also start at US$399 (about AU$425). Details are scarce on the upcoming Z40 and Z50 laptops, previously announced at CES 2014. What we do know is that AMD's new APU processors and R7 Radeon graphics chips will be available. Prices start at US$579 (about AU$620). Lenovo also lifted the lid on 14-inch and 15.6-inch additions to its Flex 2 "almost a hybrid" laptop range, both of which tout 1920x1080 resolutions. The former packs the now familiar Intel and Nvidia mix of chips, while the latter is all AMD. Prices start at US$429 (about AU$460) and US$799 (about AU$855) respectively. If the PC is dead, what's all this innovation about?